Drinkers pack the sidewalks in fashionable Deansgate. A police siren screams above the traffic noise and everywhere the raucous mating calls of clubbers and pubbers. Below is a quiet canal path where long boats slumber at their moorings. The still black water reflects light from the mirror-ball façade of converted warehouses. A lone couple each carrying a shoe bag step into shot and walk across the iron bridge, talking quietly. 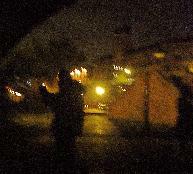 Through one of its dark archways we see several people approaching, all carrying shoe bags. Some also have folding chairs, cool boxes; one has a sound system. A willowy woman pulls candles out of a bag and sets them to burn on the concrete floor. Their flickers illuminate the worn brickwork of the archway, the prison-style grille through which one glimpses consecutive deserted caverns like this one, quiet and hidden beneath the din of Deansgate. Yearning notes from a bandoneon. Then the passion of a swirling violin. To an irresistible Golden Age tune couples take to the paving stones. EXT. CANALSIDE. LATER THAT SAME NIGHT. Spectators stand transfixed by the movie-set spectacle of dancers doing intricate steps, entwined in dark relief against the sulphurous city-night sky. But what are they doing here? Street tango. I heard about it; never seen it. Cool, ain’t it? Unbeknown to me the Tango Soul school were having a demo – twenty or so dancers doing group performances. I reckon they’d all brought along every relative, workmate and old flame they’d ever had. Even the gallery was packed. On the floor, couples danced almost shoulder-to-shoulder, certainly within boleo-striking distance. So these were out, along with all other showy stuff. The result was pure, BsAs salon tango bliss. Leaders became skilled navigators, followers kept their feet on the ground, and people tried to make the most of their respective half-meter squares of space. Everyone I danced with succeeded. I was gifted with wonderful musical interpretations and I melted (literally too -- did I say it was BsAs in January humid?) into the necessarily close embrace of my admirable partners. I wasn’t the only dancer struck by how enjoyable it was to barely move. Afterwards all the better leaders and followers discussed how they’d relished the chance to minimize everything, concentrating on floor craft, technique and musical interpretation. Interestingly, when the crowd thinned out at around 1.30, the dancing changed. With room to move, leads became bolder. Soon I was amidst the ‘adas ( sacada, colgadas, volcadas, you know ‘em; you know we shouldn’t be doing ‘em in a traditional milonga.) Next thing I knew I was lead into a gancho, which resulted in me spearing a gent’s leg. My partner’s fault, not mine, but that didn’t make me feel any better when we got the Tut-tut treatment. It was then that I decided to remove my lethal weapons – my 8cm CIFs and ballet pump it instead for the remaining tandas. I’m glad I did… the DJ then played a hectic jive tanda (de riguer in BsAs now) and luckily for me I was with the webmeister, so we burned the floor as only old jivers can. Qué divertimente! My accolade of the evening goes to a man I’ve danced with but once. Then I called him the Caique as our encounter was a lovely relaxed thing, like sunlit bobbing on the Med. Well guess what? This leader can now plumb depths the Trident might struggle with. In the midst of Red Lion Square, our little boat turned into a luxury liner and we dream-cruised around that floor, tanda after tanda. Thank you, Ghost, for reminding me why I love tango. Hasta pronto, espero, La Dulce. I’ve been in a dance desert these last few months. Pressure of work. But I have had occasional visits to oases like Mike’s milongas in Birmingham or the International Tango Festival in Edinburgh. At the latter, I drank greedily from the well-spring of tango thanks to living legend, Horacio Godoy. No. I will. Not just wax but add some shine to the man’s already lustrous reputation. Horacio Godoy’s workshops were SENSATIONAL. Far and away the most inspiring classes I’ve taken to date, despite being a stretch too far, for me. I found them to be Advanced in every sense of the word. And looking about, it seemed most of the students were over-faced -- domestic dancers and Europeans alike. So how does GOD-oy reach parts that other tango teachers don’t, you might ask. Well, his teaching seems to have its genesis in the music. In the classes I did, he worked only to one track. Naturally the piece was chosen to perfectly fit the movement he wanted to demonstrate. NOTE: It is MOVEMENT – full body movement, based soundly on good technique. Godoy does NOT teach sequences as far as I could see. He teaches musicality, technique and attitude. The caballero attitude for example, which hinges around his wonderfully elegant invitation to follow. Very chivalrous, very gentlemanly, therefore caballero. Godoy, like all the best teachers, talks about the core ( el centro) initiating moves, about having to contract it (hold it) to give lightness to the feet and stability on the axis. But you knew that was the key, didn’t you? The lesson is carefully structured. It begins with relevant history/geography – e.g. in the Villa Urquiza class, this is about the preferred dance styles and composers/band leaders in the different barrios; or if it’s music, this would relate to the different eras. Then Godoy plays the tune, the relevant part of it, and picks out the thread he wants the students to listen out for. He hums it, repeatedly, playing with the sound via his voice , grunting, gasping, parping… whatever suits the mood. This is more than just comic relief. It embeds the rhythm in one’s brain. He insists the students move only to one thread, say the violin, matching move to music. The technical challenge is doing it at sub-snail pace. Oh, the pain! And we were instructed to walk as if on eggs, carefully placing every bone in the foot, in turn, on the floor, before actually transferring weight. To say it was technically demanding is like saying Vuvuzelas are noisy. He and Cecilia also performed three of the best demo dances I’ve ever seen and his DJ-ing on the Sunday night was great too. What can I say? I love Horacio! Sunday, Uffington village hall, daffodils bobbing on a grassy bank, a shire horse nosing over the fence. Peaceful, after the challenge of the Enganche/Volcada workshop with Eduardo Bozzo. I plan to laze on the lawn and skip the milonga. I’m tired; too much tango last night - in Birmingham, then in Stoke, the 3am stop-at-the kebab-shop some fun too far, perhaps. A shadow above me, blotting out the sun. Can’t be a plane; haven’t seen one in the sky since it turned Icelandic ashy. Wait, Maestro Bozzo has brought a friend up from Bristol and this celestial body is asking me to dance. Mmm, I’m not that tired after all. Oh, oh-oh-oh…..I’m being danced – really danced., with skill, verve, brio. Unexpected – have I slipped through a cosmic gap and into another galaxy – one where leaders like those in the salons of BsAs materialize in the English countryside? Transport of delight! I lock onto this lead like a space pod to the mother ship. I am transfixed by the Martian’s turns, twists, his speed-of-light inventiveness, his musicality and care. Not once does he drop the connection to leave me to dither or doubt. But the once when I interrupt our telepathy and toss in a gancho that isn’t lead, he is witty about my temerity and ‘punishes’ me with an ostentatious invitation to do it all again. I’m giggly, giddy… and his! When, after five, (could he have been having a heavenly experience too?) out-of-this-world dances, I am returned, weak-kneed, to my chair, I stare at his retreating back, expecting him to be green or have kryptonite soles on his dance shoes. But no, he’s just suede-shod. Human, after all. The green haze must be me glaring at the next Shropshire lass he asks to dance. A friend wrote this in response to my recent Eve's Dropping posting in praise of older women. "Although younger women can have great energy and nubility, for leaders, I think the best dancers are over 40, because it requires emotional intelligence and experience to really explore the dance-- younger men and women don't really grasp the connection, can't give enough trust, and can't fully savour the intensity of the beast with four legs, the moments when you really move as one without any idea where you are heading. They can also enjoy the physical intimacy without getting anxious and insecure. Unlike other dances, I think tango improves with age, and certainly only older women really have what it takes." Form an orderly queue, mujeres grandes, and I'll slip you his phone number. “That’s becos’ Latinos understand that an older woman is more generous, ” I said, thinking of examples like my porteña friend who remarked about a particular, high-profile dancer. “He needs a lot of praise, that one.” I assume she gave it; he kept coming back for more. Older women are forthright and honest. They'll tell you right off if you are a jerk if you are acting like one. You don't ever have to wonder where you stand with her. ~ La Dulce, ji, ji, ji. There is life after the flashing (non-crashing) salons of Buenos Aires, it turns out. 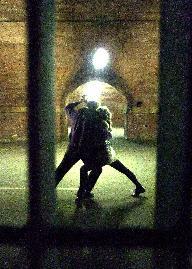 Last weekend my sagging spirits revived at a milonga run by Tango Manchester. I’ve heard the Longfield Suite described by many as having the best dance floor outside of the Blackpool Tower ballroom. I’ve never been to the Tower, but it must be awesome if it beats the gleaming stretch of sprung mahogany that graced this place. Outside was intimidating: down a dead end in Prestwich, concrete 60s block, car park littered with Hoodies. Not sniff of Starbucks in the chippy air. But inside, plush enough -- big reception area, long bar, fairy lights and tables (too many for the relatively small number of dancers) but oh, that floor. Room even to planeo, (not I, not since my wilful limbs have been re-educated) an excellent sound system, and DJ Joel’s superb Pugliese tandas. So, I was smiling, especially after the maestro complimented me on my …. Embrace. The Tango Anarchist’s theory is that for tango dancers, Buenos Aires is like The Emerald City in the The Wonderful Wizard of Oz. Get there, and you find what you are looking for. And it was there all the time. Si, claro asi, the journey’s the thing, not the destination.